Two years after his birth, Marcelle died on July 7, 1935 because of a meningitis. During this period, Edith Piaf lived a few months of odd jobs but resumed her vocation as a street singer with his partner Momone, street singer like her with whom she had begun to fourteen. In fall 1935, she was spotted in the street and engaged for a week by the Director of cabaret Le Gerny’s, located on the Champs-Élysées. Her success was immediate, she sang for seven months. On July 7, 1935, her daughter Marcelle died of meningitis. The degree of the day is at 14° 14′ of Pisces. It has a Very Powerful force in House IV. It is conjunct with the transit of Saturn and Jupiter. The degree of the year is set to 28° 56′ of Leo. This is the exact degree of Mars of Very Powerful force at the Midheaven. At nineteen years and six months, it announces the Mercury-Moon period. The Moon has a Very Powerful force in House VII and with a nocturnal birth. The degree of the year has a Very Powerful force because it is located in the exact degree of Mars culminating Midheaven. Mars is the Governor of the House V, that of children (4° 28′ of Aries). At death, Mars transit is in Libra where it is into its sign of Detriment with a Very Evil quality and with a conjunction with the Twelfth House, that of diseases. The degree of the day has a Very Powerful force at 14° 14′ of Pisces and in House IV, that of illnesses of children (House IV is the XIIth house derived from the house V, that of children). It is conjunct with the transit of Saturn and Jupiter. It’s also the exact degree of Saturn (14° 21′). The protective power of Jupiter was blocked by the harmful energy of Saturn which has an Evil quality in Pisces. Saturn evil is synonymous with bad luck and fatality. On July 7, 1935 is set at 14° of Pisces, in natal House IV and House VIII of SR. 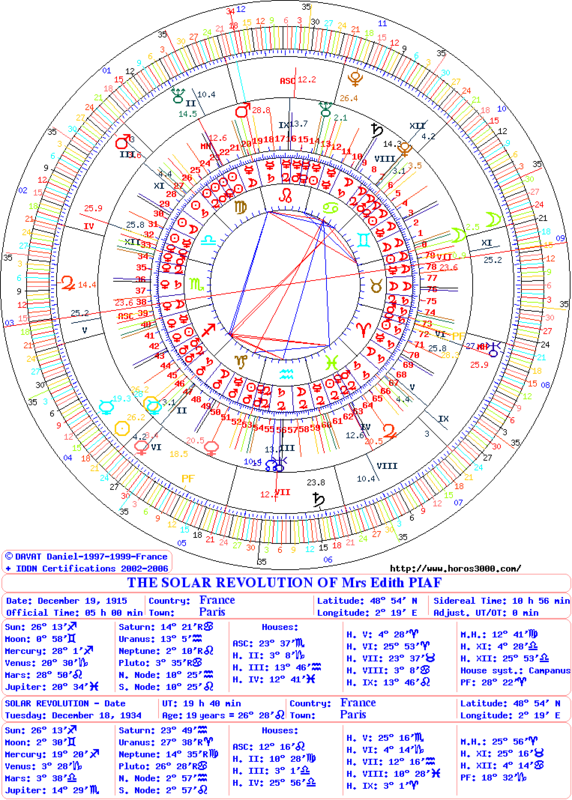 The degree of the year is at 26° 28′ of Leo conjunct with natal Midheaven and the Ascendant of SR. The degree of the year is conjunct with Mars of Very Very Powerful force (MC + ASC) and Governor of the natal House V, that of children. Saturn is the master of the period. It has a Very Evil quality in Cancer its sign of Detriment. It is into natal House VIII, that of the end of life of children (House VIII is the IVth derivative house, the end of life, of the House V, that of children). House VIII is also that of the biggest vicissitudes of life. Saturn is also into the House XII of SR that of the diseases. Saturn is conjunct with the cusp of the natal House VIII which itself is conjunct with natal Pluto, the god of death of ancient times. 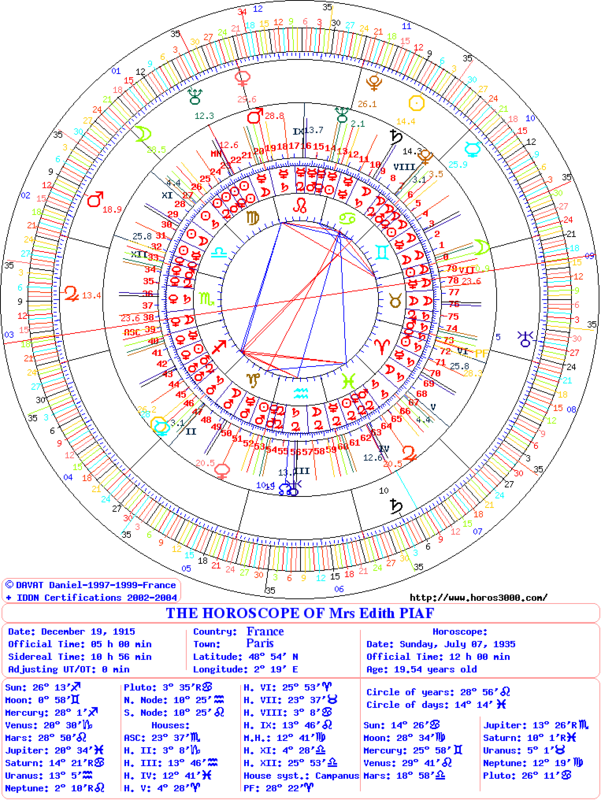 Natal Pluto is positioned in a dissonant square aspect (90°) to the natal House V.
The degree of the day is at 14° of Pisces, in natal House IV and House VIII of SR. This is the exact degree of natal Saturn (14° 21′) of Evil quality in Pisces and into House VIII of SR that of vicissitudes. This entry was posted on Friday, April 4th, 2014 at 6:21 pmand is filed under Diseases, Edith Piaf. Both comments and pings are currently closed.